A team of physicists and biologists working at Saarland University has developed a method with which they can measure the contact area between a bacterium and the surface it is 'sitting' on. Interestingly, and perhaps counterintuitively, a large contact area does not necessarily mean a large adhesive force. It turns out that specific features of the bacteria, which result in local differences in the composition of the proteins in the cell wall, are the main reasons for the observed differences in adhesion. These results can now be used to optimize antibacterial materials. The research work is being published today in the journal Nanoscale. Bacteria of the species Staphylococcus aureus are among the most widespread and dangerous pathogens of our time. One of the reasons for their effectiveness is their ability to adhere to both synthetic and natural surfaces, where they form very persistent biofilms. These biofilms effectively protect the individual pathogens making them very difficult to remove from a surface. This is why their presence on medical implants is so feared and why they are a major cause of post-operative infection. One approach to preventing infection is therefore to prevent the formation of the biofilm. But in order to be able to influence biofilm growth, scientists need to understand the mechanism by which the bacteria adhere to surfaces. For example, it would be useful to know just what fraction of the surface area of a single bacterial cell is actually in contact with the surface. However, as these spherical bacteria are only a micrometer across (about one hundredth the thickness of a human hair), it was unlikely that conventional light microscopy could be used to determine the contact area. The Saarland University team led by the experimental physicist Professor Karin Jacobs and the microbiologist Professor Markus Bischoff therefore made use of another property of the bacteria, namely that the strength of adhesion exhibited by different species of bacteria often depends strongly on the type of surface on which it is situated. For instance, the bacteria that were the focus of the present study adhere much more effectively to strongly hydrophobic surfaces than to wettable (hydrophilic) surfaces. The researchers therefore created a silicon-based surface that exhibited both properties – strongly hydrophobic in one region, highly wettable in another – within an extremely small area. The adhesive force exerted by individual bacteria on this specially prepared surface was then measured using a scanning atomic force microscope, known as a force spectroscope. 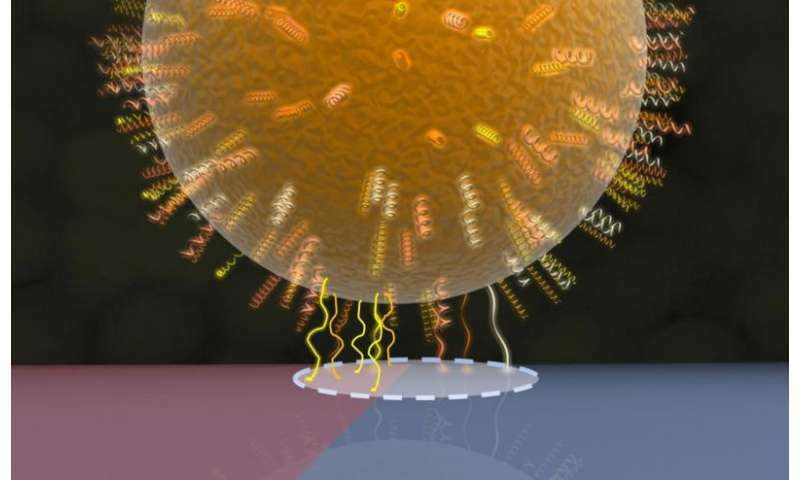 The method involves bringing a single bacterial cell into minimal contact with the surface and then measuring the force required to detach the bacterium from that surface. This is the adhesive force. On the hydrophobic (literally 'water hating') part of the surface, the force is roughly ten times greater than that needed when the bacterial cell adheres to the hydrophilic ('water loving') region. This procedure is then repeated with the bacterial cell located successively closer to the boundary between the hydrophobic and hydrophilic regions, then measuring the force with the bacterium located on the boundary itself and finally with the bacterium situated in the purely hydrophilic zone where the adhesive force is at its weakest. The measurement data relating the adhesive force of a single cell to its exact position on the specially customized surface, and therefore to the wettability of the surface, has allowed the Saarbrücken research team to infer the size of the contact area between the bacterium and the surface. The method can also be used for other measurements, such as determining the adhesive force of colloidal particles, which are also spherical in shape. The research team discovered that the diameter of the contact area, which was assumed to be circular, was of the order of a few tens to several hundreds of nanometres (a thousand nanometres are equivalent to one thousandth of a millimetre) and that the size of the contact area can vary significantly between different individual cells of the same species Staphylococcus aureus. For the purposes of comparison, a non-pathogenic member of the genus Staphylococcus was also studied that adheres far less strongly to the surface than the pathogen Staphylococcus aureus. It is particularly astonishing that the size of the contact area has absolutely no effect on the strength of adhesion between a bacterial cell and the surface. The researchers were also able to demonstrate that despite their spherical shape, the bacteria cannot be described simply as hard spheres when they interact with a surface. A more accurate description is to think of them as balls that are covered with a soft, shaggy and uneven coating of cell wall proteins and that this coat is the main factor determining adhesion between the cell and the surface. The pronounced local variability in the adhesive force reflects the different compositions of the groups of cell wall proteins, which determine how strongly a region of the cell's surface is able to adhere to a surface. The approach used in the study can, in principle, be applied to all other species of bacterial pathogens no matter whether spherical or rod-like in shape. The results may well pave the way to developing surfaces whose morphology can be carefully adjusted to modify these adhesive forces, thus suppressing the adhesion of unwanted bacterial pathogens, or, alternatively, encouraging the adhesion of bacteria, such as those used in waste disposal, whose presence is desired.